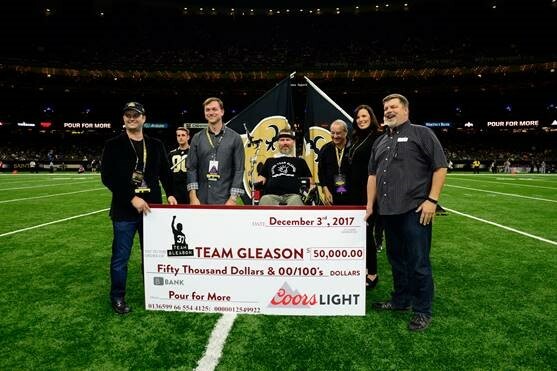 Recently, Coors Light partnered with the New Orleans Saints and former Saints’ player Steve Gleason to make a charitable donation to Gleason’s Foundation “Team Gleason” in support of research to find a cure for the disease amyotrophic lateral sclerosis (ALS), commonly known as Lou Gehrig’s disease. Gleason played with the Saints from 2000-2008. Shortly after his retirement he was diagnosed with ALS in 2011. Since that time, along with family and friends, Steve has formed the Team Gleason Foundation with the mission to support research for treatment, inspire those with the disease and show that patients can not only live but thrive after the diagnosis. In support of Coors Light’s “Pour for More” initiative that is designed to creative advocacy around causes significant, the beer brand donated $50,000 to the New Orleans-based organization to support additional advocacy programming and research. A ceremonial in-game check presentation occurred at the Saints week 13 win over the Carolina Panthers. 2017 marks the first year that Coors Light has partnered with Team Gleason. Through partnerships with local retailers and distributors, a portion of the proceeds from cases of Coors Light were to be able to make this donation possible. This is just one of the ways that parent company MillerCoors supports the local community and causes throughout the country. Subscribe to Saints Gab via RSS Feed or E-mail and receive daily news updates from us! Sign up to receive our daily Saints Gab newsletter, and keep up to date with all the latest New Orleans Saints news. 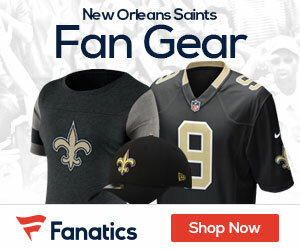 Celebrity Seats has all the best New Orleans Saints Tickets and New Orleans Hornets Tickets!